I've noticed in the past few months or so that my skin has started to become quite dry. As I've mentioned once or twice before in other entries, I have combination skin so I've always had dry areas on my face, namely my cheeks and around my nose, while my t-zone has remained as oily as it ever was. But it seems my dry areas have grown even drier and I can't really figure out why. Perhaps it's because I'm getting older? Aging usually leads to drier skin after all. Yes, I'm only 24, but it doesn't mean my skin won't start changing already, right? If you're like me, or just have dry skin overall, you'll know what a pain it is when you take the effort to moisturize, apply your makeup, and see that your skin is still dry and only emphasized because of your makeup. In my case, it usually happens once I apply powder and it 'gathers' and 'clumps' around dry patches on my face. Now I'm on the hunt for a good moisturizer that'll not only effectively hydrate my skin, but also not add to the already existing oiliness of my t-zone. So what did I decide to go with first? 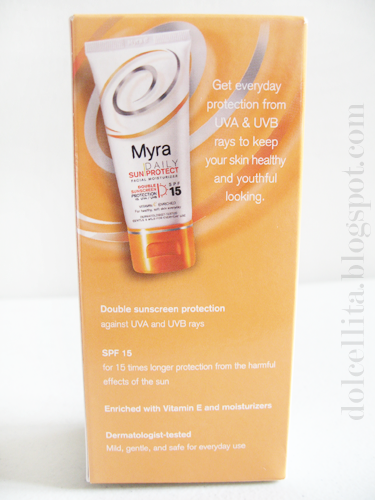 Myra's Daily Sun Protect Facial Moisturizer (Double Sunscreen Protection w/ SPF 15). 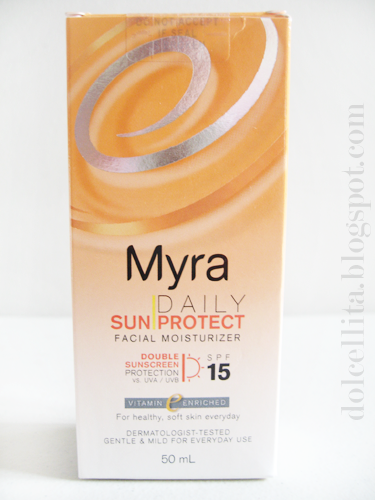 I was immediately attracted to this product because I really liked the idea of a moisturizer with added SPF so I don't have to worry about applying sunblock anymore as well, and SPF 15-20 is the minimum needed for necessary everyday protection from the sun. Oh, and it's also enriched with Vitamin E as you'd expect from Myra, so at least you'll be nourishing your skin too at the same time. The product comes in a squeeze type bottle with a flip-top cover which I prefer a lot more than the covers which you have to 'screw' on. However, for some reason, even if I'm careful to squeeze gently to just dispense what I need, I find that I get a lot more than I was hoping for and I get a bit of wastage every now and then. 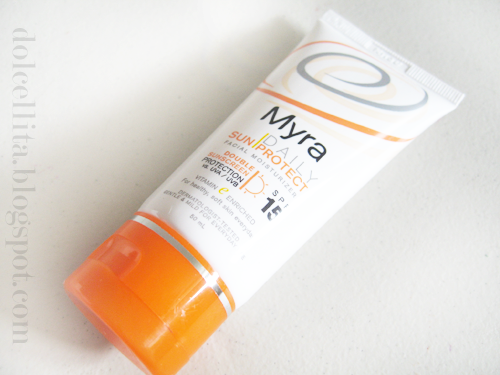 The product itself, just like all the other variations of the Myra moisturizers, is nice and lightweight in feel and doesn't leave you greasy at all after applying. It also absorbs quickly into the skin. As for scent, it smells like a more delicate version of regular sunblock, as you'd expect I guess. I quite like this product, actually. As it claims, it does make my skin soft and also a little supple immediately after I put it on. However, despite the fact that I've been using this regularly for the past couple of weeks (every morning as part of my daytime skincare routine, specifically), I find that its hydrating power doesn't seem strong enough for days when my skin is a little drier than usual. I'll still see skin flaking off around my nose a little and dry patches on my cheek when I apply bb cream/foundation or powder a short while later. In other words, I was hoping for a moisturizer that could handle even my extra dry days! Skin can be temperamental at times, as we all know. In the end this would probably be better suited as an everyday day moisturizer for those with normal or combination skin as long as your dry areas don't get a little extreme at times like mine! I haven't noticed growing any oilier from using this so if you've got oily areas on your face, it shouldn't add to it and make it worse. I still wouldn't recommend this for people with oily skin overall though. Find an oil-free moisturizer for your particular skin type instead just in case! Affordable! I can't quite recall how much I bought this product for (will edit this when I check soon), but it was definitely less than PHP90.00 for 50ml worth of the stuff. I most likely won't be repurchasing this. I can't say I regret buying this product, it certainly delivers with its claims, but not enough for my needs basically! Extra, long-lasting hydration to get rid of that dry, flaky skin is what it lacks for me.